In order for an existing notary public to become an online notary on the Notarize platform, the notary must acquire a digital certificate (digital signature) and register themselves with the office of the Secretary of State. Notarize currently uses IdenTrust Services, LLC to provide commissioned notaries public with digital certificates that meet the standards for the signature — one of which is to make sure the digital signature matches exactly to the name on the current notary commission certificate. Once verified, IdenTrust will provide the applying notary public with an X.509 Digital Certificate. The digital certificates will be managed and controlled by IdenTrust Services as part of its Access Certificates for Electronic Services (ACES) program. IdenTrust Services, LLC will supply Certificate Authority (CA) service to citizens located within or desiring to interface with the department in a Public Key Infrastructure (PKI). In order for a relying party — e.g. county clerk, courthouse, state agency — to independently verify the validity of a Notarize Digital Certificate, they must first install a file in file in their Adobe Reader or Adobe Acrobat desktop software. This file creates a trust relationship between the PDF reading tool and the IdenTrust ACES Root certificate. In Adobe 6 - "Trust Signatures created with this Certificate"
In Adobe 7, 8 - "Trust this Certificate for: Signatures and as a Trusted Root"
4. Click "OK" or "Import", click "OK" again, then click "Close"
*The steps above also apply to Adobe Acrobat, if installed. 1.You must have a downloaded copy of the document to be verified — i.e. you cannot verify the digital certificate directly within a browser or email software. 2.Open the document in your Adobe Reader/Acrobat desktop software. 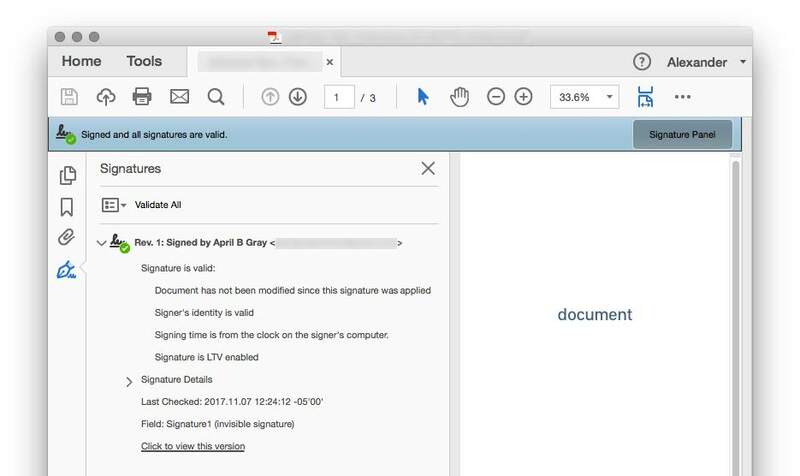 4.To inspect the details of the digital certificate, click the “Signature Panel” button in the signatures bar. 5. Within the Signature Panel you can quickly assess certificate ownership and validity, and ensure that the document has not been modified since the signature was applied. display additional information related to the signature owner and certificate authority.